Gillian Lee Smith: Happy New Year!! Mosaic - Places 2008, originally uploaded by gilfling. Well I am a day late but I do hope you enjoyed welcoming 2009, however you chose to do it. So many wonderful things have happened this year for me creatively and professionally and I am excited about what 2009 may bring. I do feel I have achieved quite alot in 2008 and I even thought about going through my years blog posts to read about what I have been up to, to remind myself - however I very quickly realised about 2 posts in that I didnt want to get bogged down in reflecting on the past - I just want to get on with doing and living and creating 'now'! - Visit more places and take more photographs - this is part of me learning to moderate my 'work time' and 'play time' and create greater balance enabling Mark and I to get out more. I want to 'see' more - places, details, landscapes, colours - part of this is also remembering to take my camera out with me (something which I have not been very good at up till now) and really capture more inspiration. So although these are more general goals I have also been thinking about the specifics of how I am going to achieve these things - this is a work in progress and I have alot more to think about! One thing I do want to remind myself of is just how much I enjoy writing this blog and even more how much I enjoy the people I have come to know (both in the internet and 'real' world) - so thank you very much for continuing to visit and comment and share this space with me. Wishing you a wonderful year for 2009. I always enjoy visiting your blog to see your beautiful art works. Thank you for sharing and I wish you all the best for 2009. Happy New Year to you too Gillian! This is my favorite of all your mosaics. The photographs you take of your little slice of heaven in England always create a place for me to stop and breathe. I have deep fantasies of coming to explore the green world of all the British Isles and your photos feel a bit like coming home for me. I can't wait to see what's new for you in 2009. Happy New Year and much success to you! Your photographs are lovely and I so enjoy looking at each one. One of these days I will get back to that part of the world...for now I will be satisfied exploring Arizona. Hugs to you! Happy New Year and very best wishes with all your wonderful art. What wonders you have created! I have fallen completely in love with your dolls. Incredible! May the new year bring many more wonders for us all to enjoy. 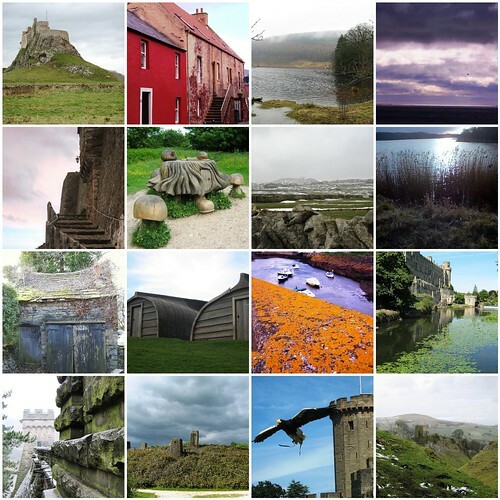 Happy New Year to you, love the photos, some of them look very familiar, Holy Island??? I love it up there.